The Philosopher and I still had time to kill before our evening’s concert entertainment in Knoxville. So we left our disappointing pizza experience at The Tomato Head to grab a slice at a place my other son, The Kid, recommended. We were clueless about its actual name and location since The Kid’s full intel was nothing more than that there was a pizza joint in between the Tennessee and Bijou theaters. (He had been in town for the Big Ears Music Festival.) 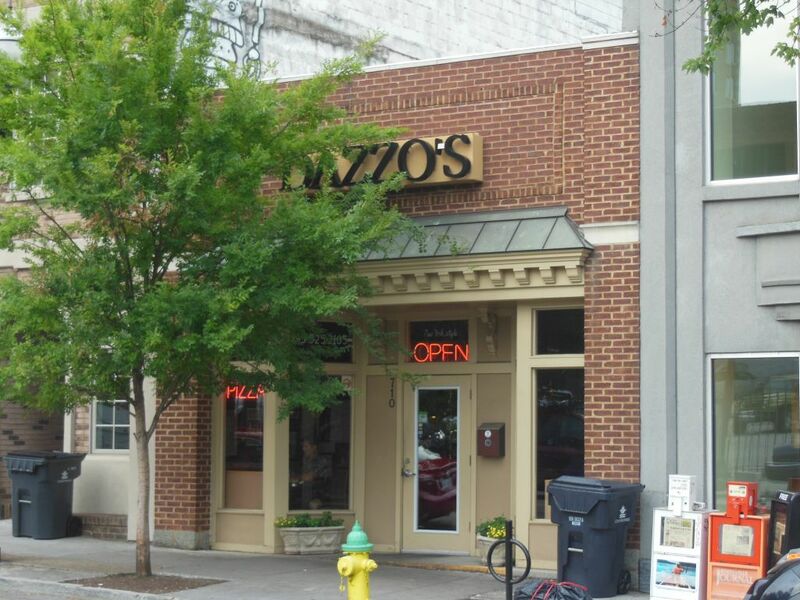 Strolling down Gay Street, we eventually found the storefront of Dazzo’s Pizzeria partially hidden by a tree. Fitting of its position between the two venues, Dazzo’s sports a musical theme. For starters, their slogan of “Just Give Pizza a Chance” is an obvious take on the John Lennon song. 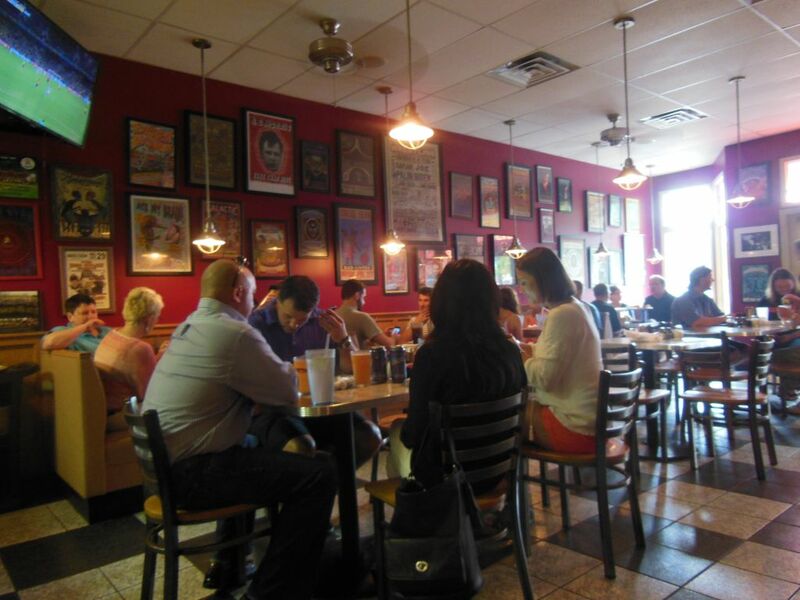 Inside their walls are decorated with a classy collection of concert posters from local area shows. 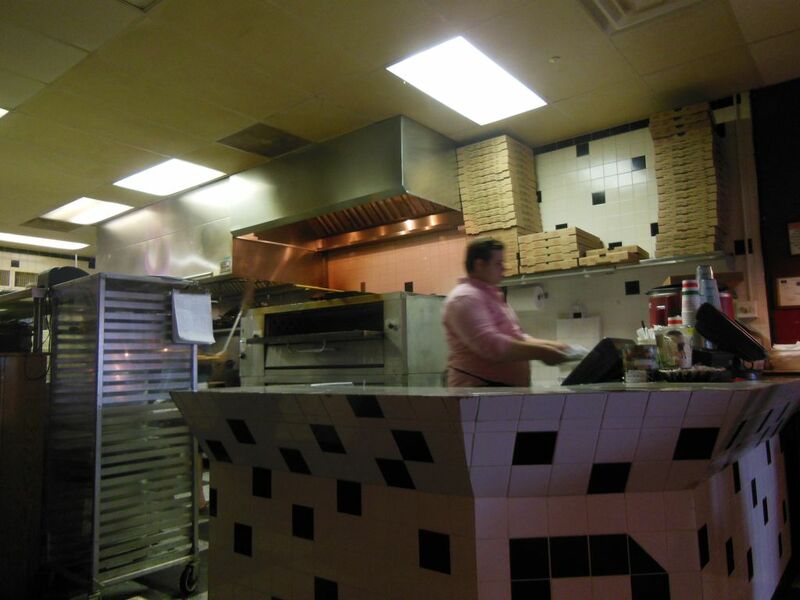 But Dazzo’s open counter and oven area and stack of take-out boxes make it look very much like a classic pizza joint. We grabbed a booth in the front seating area amongst a fairly busy dinner time crowd. My hopes lifted when I saw that they were still serving slices. I ordered a plain one for $2.50 while the young lad opted for just a beer. Looking over their menu, I saw that although they called the pizza at the top of their menu a Neapolitan, it was described as having a “New York style thin crust.” There were two other pizza types available as slices: a Sicilian and a Grandma (a thin crust pan with roasted garlic). According to the menu, the latter was the reason why the current owner bought the place. In addition to pizzas and Calzones, they also offered some traditional Italian items. After a short wait during which The Philosopher nursed his beer, my slice came on a small silver platter. There was a healthy smattering of “test cheese” on top revealing that they wanted to reheat it just right. They did just that since the slice was toasted good and crisp throughout. A nice flavorful touch of oil atop the nice thin slice started to make me forget my earlier disappointing experience a few blocks away. 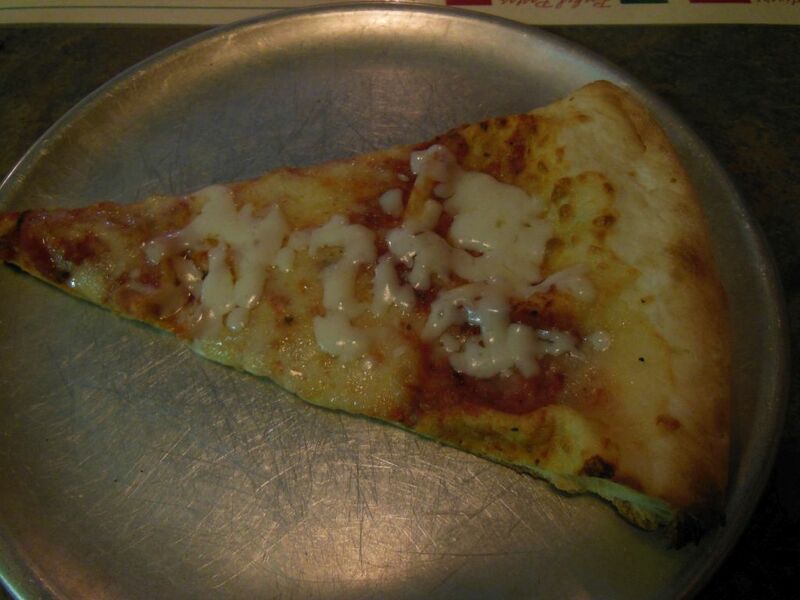 Although this slice had good classic intentions, it needed some work. Dazzo’s great effort in execution was unfortunately not fully supported by precise ingredients with their cheese and sauce blend slightly off standard. I thought that it needed more tomato sauce while something about the mozzarella cheese just didn’t taste right. Finally, when I got to the end, I found the crust to be quite dry. As the Snob rating implies, Dazzo’s slice has potential, and I’d sure give it another try if I get the chance. I’d also like to try their Grandma since I’m a sucker for unique slices on the simple side.